Shrewsbury's main swimming pool is set to reopen this weekend after more than eight weeks. The Quarry Pool has been refilled ready for swimmers to return on Saturday, while a diving board which had been out of use for 18 months has also been repaired. The Priory Road centre - which is run by Shropshire Community Leisure Trust in partnership with Shropshire Council and Serco - was shut after a poolside glass panel shattered on December 29. It was expected to reopen on February 5, but work was extended by three weeks. Facility manager Rhys Collins said: "It's really exciting to reopen. "We've put lots and lots of work into it. "We've reopened one of the boards that has not been open for a year and half. "We're excited to see our customers return." 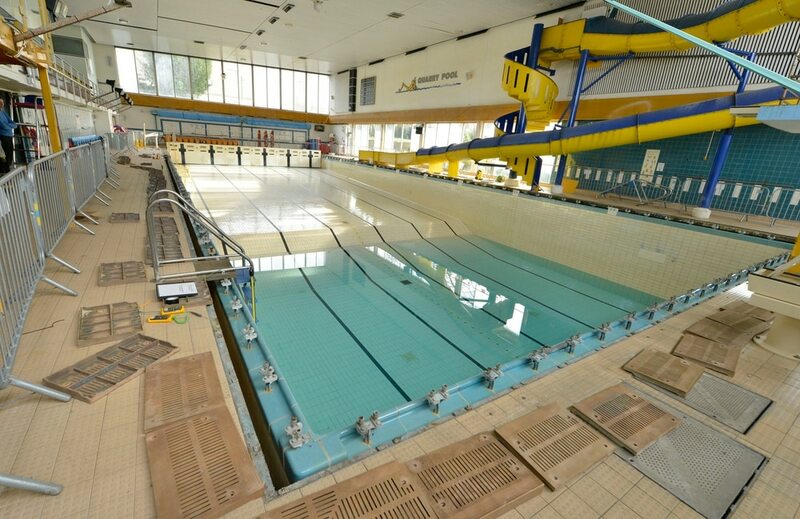 Last month Bernard Wills from the Quarry Forum met with the leader of Shropshire Council, Peter Nutting, to put forward his case for any new pool to cater to the needs of all who use it - from swimming clubs to exercise classes and beginner lessons. And he said the council needs to ensure the pool is 'future proofed' for decades to come. Bernard said: "This is the ideal opportunity for the council to build a facility for the town for the 21st century. "The important thing going forward is to ensure its future proof and and that it does fit the needs of 2040 let alone now. "We need to have the opportunities for people to swim. I urge the council to look in depth at the activities that take place and at the growth of Shrewsbury. "Not only do we need large pools, we also need pools where people can participate in sub aqua and water aerobics. We need a pool where children can learn to swim. "At the meeting I had with Peter Nutting I asked that the council build a facility that will meet everybody's needs for at least the next 30 years. "We do not want to be in a position in six years time where the council or those who use the pool say 'we wish we had done that'. "There does need to be proper dialogue to find out the needs of those who will use it before work starts. "Now that the leader of the council has said that the pool is likely to remain in the Quarry we need to make sure it is done right. "I have asked Councillor Nutting to involve us when this goes through to the next stage. "Now that they have grasped that having a pool in the Quarry is the right place for it to be, let's make certain that it does meet the needs of 2040 and beyond."